There are two absolutely required components for successful social media marketing, Strategy and Execution. When these important elements work together and are done properly, social media results are not only achievable, but they can be expected. Understanding and identifying the friction points that are inevitably present within these two components can be challenging. More importantly, reducing the friction within your social media management is crucial to your social media success. Unfortunately, there is a significant difference between strategy and execution. There is often an even wider gap between strategy and the ABILITY to execute a social media strategy efficiently and effectively. Often this chasm between strategy and execution is due to unidentified frictions in workflow, processes and tools being used in the social media management process. Consider workflow to be specific processes, functions and procedures that are required in order to fulfill your social media strategy. These elements are made up of all of the tasks you do (or need to do) on a daily, weekly and monthly basis. Clearly defining these tasks in detail and creating processes and procedures to implement them in an efficient and scalable way is what workflow is all about. Anything that gets in the way of that workflow causes friction in your ability to execute the strategy, do it efficiently or even achieve your overall strategic objectives. So What Is Social Media Friction? Merriam-Webster’s defines the word friction three ways: the act of rubbing one thing against another; the force that causes a moving object to slow down when it is touching another object; and the disagreement or tension between people or groups of people. Though some of use could conceptually tie some of these definitions somewhat theoretically to social media, they don’t quite fit. My definition of social media friction is any process, workflow, tool or hindrance to the smooth and efficient execution of a comprehensive social media strategy. Furthermore, friction can also be any obstacle or resistance encountered by members of your community to engage with you, discover what you do or to buy or inquire about your product or services. In social media, friction can be any function that resists the fluid momentum and execution of progress toward the overall goal objective or objective of a defined strategy. Am I getting too technical here? There are typically two kinds of social media marketing friction that negatively impact effective and efficient execution. What’s The Cost Of Friction? 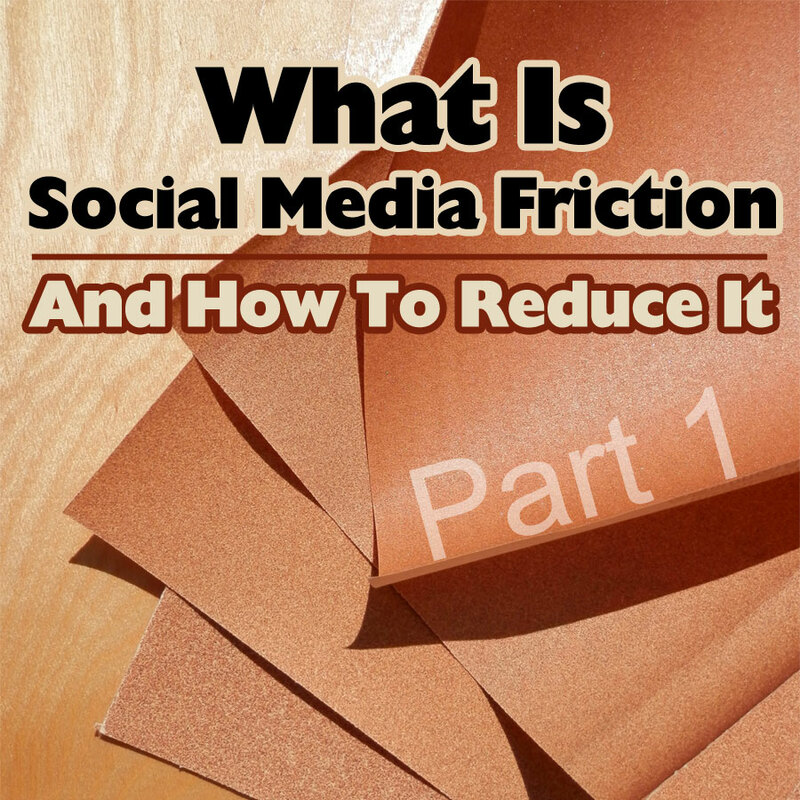 Friction cost is the direct or even indirect costs associated with the friction within your social media marketing. Friction can include actual hard costs and fees for things like inefficient or ineffective tools or even additional staffing. Some of the more difficult to measure are opportunity costs, resulting from missed sales opportunities and overall lack of results with social media marketing. There are some mechanics in life and business where friction can be a good thing. For example, without friction you would not be able to deploy brakes on your car and bring it to a stop. In business, some bureaucratic friction is required for decision-making and spending in order to make such things more measured and controlled. However, within social media marketing identifying and reducing the friction forces that hinder smooth effective execution is a sticking point that many overlook. During this series we will attempt to dissect the discovery and reduction of social media friction that many marketers face and provide some solutions that will enable you to make adjustments. What are the main friction points in your social media management?